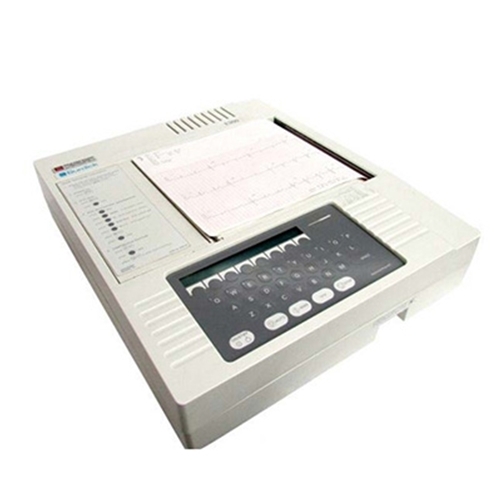 A multi-channel interpretive electrocardiograph that employs a thermal-array print head to produce high-definition ECG records in a choice of 3, 4, or 6 channel formats. In additon to its resting capabilities it can be used in a stress system environment. Menu-Driven and Easy to Use. Full Page 8.5" x 11" Printout. Atmospheric pressure (Operating): 645mm Hg. to795 mm Hg. Atmospheric pressure (Operating; 375mm hg. to 795 mm hg. Lead marking: lead identification imprinted on each lead trace above waveform.